Welcome to IAMHH Temple University. Class # 1 is being conducted by Rami Salaam El. We cover information in the Bhagavad Gita, The Gospel of Hip Hop, The Holy Koran of the Moorish Holy Temple of Science, Law, Astrology, and Moor. 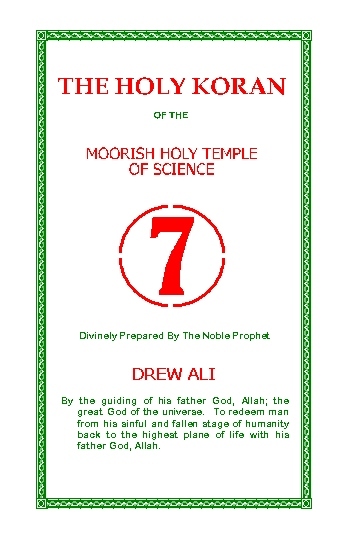 If you are claiming to be a scholar, teacher, lecturer, etc, and you speak about Noble Drew Ali, The Holy Koran Circle 7, or the Moorish Divine and National Movement, I humbly and respectfully ask that you be wise and exact with your information. And if you are one who is attempting to mislead the people, please know that you will not be successful. You will only be causing yourself more pain. 1. Among the priests of Jagannath was one who loved the Jewish boy. Lamaas Bramas was the name by which the priest was known. 3. And Jesus said: “Truth is the only thing that changes not. 4. In all the world there are two things; The one is truth; the other is falsehood, and falsehood that which seems to be. 5. Now truth is aught and has no cause, and yet it is the cause of everything. 6. Falsehood is naught, and yet it is the manifest of right. 7. Whatever has been made will be unmade; that which begins must end. 8. All things that can be seen by human eyes are manifests of aught, are naught, and so must pass away. 9. The things we see are but reflexes just appearing, while the ethers vibrate so and so, and when conditions change they disappear. 12. And Jesus said, “Man is the truth and falsehood strangely mixed. 15. And Jesus said: “It is a manifest; is the result of force; it is but naught; it is illusion, nothing more. Force changes not, but power changes as the ethers change. 26. And Jesus said: “Faith is the surety of the omnipotence of Allah and man; the certainty that man will reach the deific life. 27. Salvation is a ladder reaching from the heart of man to heart of Allah. 28. It has three steps; Belief is first, and this is what man thinks, perhaps, is truth. 29. And faith is next, and this is what man knows is truth. 30. Fruition is the last, and this is man himself, the truth. Much love and appreciation for you seeking the truth. You are on the path. Keep going. Keep Shining. Below are links for the Students and Teachas alike.